The Rothman Institute Ice Rink at Dilworth Park is an unparalleled entertainment experience on Philadelphia's center stage in a wonderfully unique urban setting. The rink even has extended hours on holidays: Through December 30, 11am-11pm; New Year's Eve, 11am-12:30am; New Year's Day, 11am-11pm; January 16, 11am-9pm. Admission is $3 for children ages 10 and under and $5 for adults. Skate rental is $10. Visit DilworthPark.org/rothmanicerink for special events, rental information, and more. Warm up with hot seasonal cocktails featuring Jim Beam Apple and Sam Adams craft beer and an artfully-crafted menu at Rothman Cabin with offerings from Air Grille by Brûlée Catering including items to savor and share such as poutine and chili. Brush up on your skating or just watch and enjoy the great food and drink. Adults 21 and over can enjoy a glass of wine, a specialty cocktail featuring Jim Beam, or a Sam Adams craft beer starting at 5pm on weekdays, and 11am on the weekends. For a complete menu, visit DilworthPark.org/rothman-cabin. Calling all zombies on Friday the 13th! Come dressed as a zombie and be entered to win a special prize that includes free tickets to the Rothman Rink, along with zombie-themed food specials in the Rothman Cabin. Partners: Eastern State Penitentiary and Capital One. Come on out and skate to a healthy new you! Ice skating burns 250-670 calories in 30 minutes! Explore resources from the Rothman Institute and others onsite to help you keep those New Year's resolutions! Kids are invited to come dressed as their favorite princess or swashbuckler for an afternoon of fun at the Rothman Rink. Kids can also keep busy with make-and-take crafts, complimentary face painting, and other activities. Partners: 101 MORE FM and The Independence Seaport Museum. Open through the end of February, a holiday-inspired Garden that was created in partnership with Greater Philadelphia Gardens. 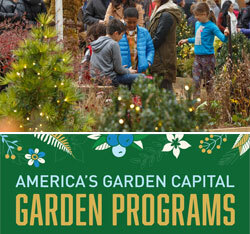 Located on the Greenfield Lawn, children and adults will delight in discovering picture-perfect moments amid the vibrant plantings, topiaries, twinkling lights, and décor that showcases all 32 public gardens, arboreta, and historic landscapes that are located within 30 miles of Philadelphia. Anchoring the center of the maze is a welcoming gazebo. Escape the winter by inviting spring into your home with beautiful and fragrant flowers. Join us for a hands-on demo. Participants will leave with bulbs that can be tricked into blooming early. No need to stop gardening during the chilly winter months. Join us as we demo some fun indoor horticulture projects that are great for the whole family. Join us to learn the basics of Tree-L-C including correct planting and mulching techniques, watering, pruning, and selecting the right tree for the right place in your home garden. Bring your tree questions too! Learn how to create and maintain a beautiful, self-sustaining, indoor, miniature garden. Join us to learn the basics of proper orchid care and check out some of the varieties that will thrive in the office setting. Logan Square Café, (Closed until January 3) 8am-2pm, seven days a week.